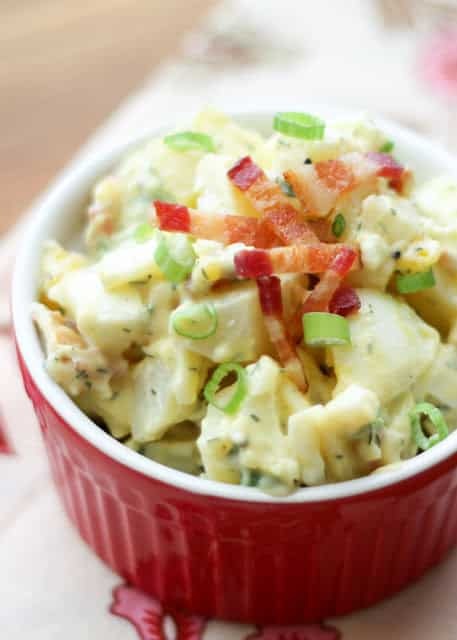 What’s not to love about a fully loaded Ranch Potato Salad filled with bits of bacon and chunks of egg? 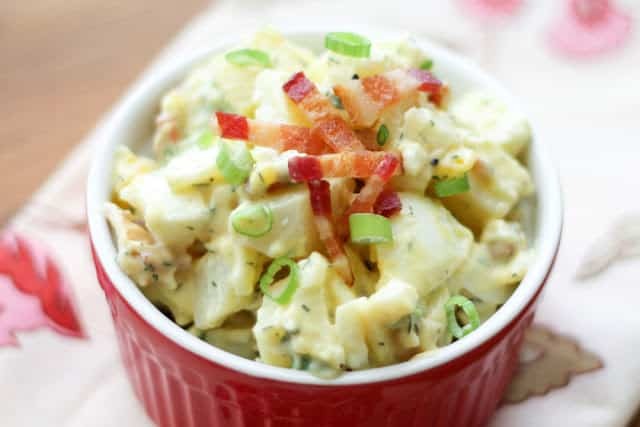 This spectacular potato salad has been my family’s favorite potato salad for over two years now. I wanted a salad with the flavors of ranch dressing, but also with some smokiness from the bacon. I used just a bit of the bacon grease to season the dressing and the whole salad picked up a slightly smoky flavor that I loved. Don’t be scared of the bacon grease, it makes an enormous difference in the final result. 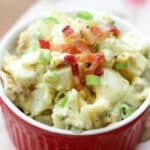 Can there be a perfect potato salad? If so, this is it. I found myself snacking on this all afternoon. Every time I walked through the kitchen, a fork managed to find its way into my hand as I opened and closed the refrigerator, just to “test” this recipe one more time. I’m lucky that there was enough left for our dinner! Combine the potatoes, eggs and bacon in a bowl and set aside. Whisk together the remaining ingredients, except for the green onion. Pour the dressing over the potato mixture and toss well to coat. Add the green onions and toss lightly. Serve immediately or chill until ready to serve. Enjoy! I am a big fan of dicing the potatoes extra small in this recipe. I keep mine about 1/2" in size and each bite is a great mix of potato and egg. You had me at bacon grease....so wrong but ohhh so right! We'll call RightWrong. Your recipie was a hit at our house! Making it again tonight we've even made variations on it by using dill pickle juice instead o vinegar and added cheese. :) love love love it! Thanks from my kitchen to yours! Looks wonderful, but at my house, this would be MAYBE 2 servings! LOL! Cor this sounds lovely.....I love egg salad, and Evan better with bacon. Something different and delicious to try! Pinning it! I made this salad about an year ago. It was absolutely great, one of the best potato salads ever. Thank you for the reminder, I have to make it again soon.